Once Herr Bangle moved his posterior out of the way, we got a good look at the 2009 BMW 5-Series GT Concept. Now we've got the full photos and pictures. We'll give credit to BMW for not actually naming the thing the Progressive Activity Sedan, because we're more fatigued with BMW's constant naming of products than we are with their constant creation of sub-categories of the automotive world (this is in the upper midrange segment according to BMW). We noticed a little anger towards BMW at the design when the first BMW 5-Series GT Concept photos came out and we're not sure people who hated it will find these professionally shot photos any more compelling. We like the concept behind the hatch and we're glad they at least included numerous photos showing off the way it works. Self-congratulatory press release below the jump. standard of intelligent, versatile functionality. frameless doors and elegant aluminium highlights. roof providing a particularly pleasant travel experience. with separate openings for additional convenience. SUV or an wagon model in the respective competitive segments. sporting performance borne out by the car's dynamism and efficiency. black panel technology and a fully integrated 10.2-inch Control Display. panel, finally, optimises the degree of control comfort on the driver's seat. in the BMW 7 Series and virtually the same headroom as in the BMW X5. that of a Sports Activity Vehicle. moved far to the rear. the daytime driving lights, finally, come for the first time in LED technology. accentuate the elegant look of the car and the sheer length of the body. rear end of the window graphics. lights extending far round into the side of the car. 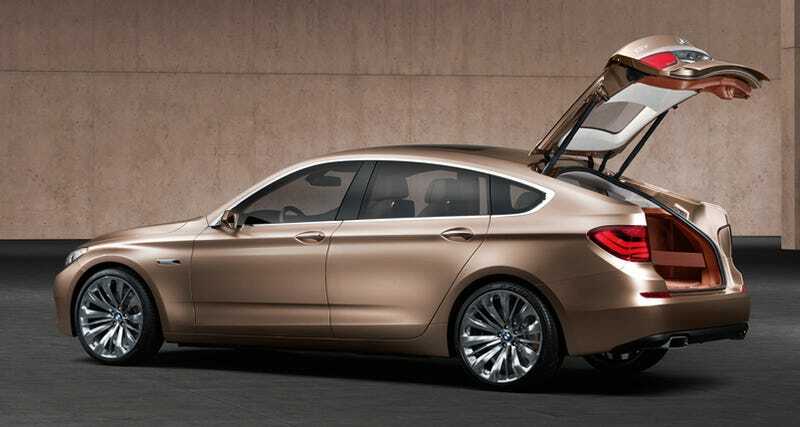 and diversity - this is the BMW Concept 5 Series Gran Turismo. experience of the BMW brand. presents all the dynamics and efficiency of a BMW dedicated to sporting performance. again characteristic of a BMW comes out clearly from every angle. An intelligent concept for modern mobility. ambience, and enjoys all the benefi ts of a variable interior. The interior of the BMW Concept 5 Series Gran Turismo combines spaciousness, personal luxury and an exquisite choice of materials to provide a genuine premium experience. seating position promotes the driver's superior control of the car. experience of first class comfort. BMW 5 Series Touring and the BMW X models. Luxurious comfort and impressive variability. luggage compartment may be upgraded to that of a BMW 5 Series Touring. made of an outstanding sedan in the upper midrange segment. through is no less than 1650 litres or nearly 58 cubic feet. released, following the respective movement of the rear-seat backrests. requirements even during the process of loading the car. two sections, likewise folding down according to current requirements. ergonomic access to the car. separated from one another, grouped together according to their functions. accentuates the generous character of the interior. Elegant interior design accentuating the unique feeling of space. on the front and rear doors with their perfect blend of shapes and colours. giving the interior its particularly comfortable and spacious character. context without any interruption between the front and rear areas. with individual elements changing not only in shape, but also in their function. armrests on the rear seats. Special concept of materials and colours within the interior. particular emphasis to the generous und luxurious feeling of space. a smooth link to the exterior paintwork. piece and ceramic units. The superior quality of the interior finish is borne out particularly by the solid wooden trim with metal inlays extending generously across the instrument panel. Instrument cluster with colour display in black panel technology. traditional style of a sports car. surface in the centre console. elegance of a Gran Turismo. the luxury and variability of the interior coming together to form a modern rendition of superior generosity. This offers both the driver and his passengers unique opportunities in enjoying the driving experience, the new flair of the car forming an ideal match with fascinating features typical of BMW, in particular uncompromising premium quality and interior design ensuring Sheer Driving Pleasure of the highest standard. competitors throughout the entire world of motoring. 155.5 centimetres or 61.2" is exceeded significantly only by BMW's X models. on the body under all kinds of light conditions through its powerful contours. Front view with that forward-pushing motion. surrounding surfaces intentionally moved further back. Dual round headlights typical of BMW, unique LED corona rings. BMW style with its clear, almost penetrating focus. look so typical of BMW. the contours of the rear light clusters. on the ground and emphasising the dynamic wedge of the body. its spacious and generous interior. light-alloy rims offering a particular touch of elegance through their multi-spoke design. above the front wheels, keeping the side panels particularly low and long. the waistline as well as the joint and contour line on the engine compartment. The "Hofmeister kink" re-interpreted in modern style . sophisticated and dynamic look around that famous "Hofmeister kink". blending particularly smoothly and harmoniously with the side panel of the car. well-known as the "Hofmeister kink". In this case the inner radius of the "kink"
same time adding a compact touch to the overall design of the car. clusters bearing the BMW logo offering an additional sporting effect. rear panel and the road. Impressive function: two tailgates in one. the BMW Concept 5 Series Gran Turismo is not visible at first sight. the process from drafts or any other effects of bad weather. only when stowing away particularly large and bulky objects. lights and being illuminated even more brilliantly when activated. is the integration of the third brake light in the rear fin again so typical of BMW. new momentum in a demanding market. the challenges created by the need for up-to-date mobility. individual style with the demands and requirements of their active lifestyle. thrilling the true connoisseur also beyond BMW's existing target groups. the BMW Concept 5 Series is simply perfect for a wonderful travel experience. with a truly comfortable interior. come together in the BMW Concept 5 Series Gran Turismo in unique style. to continue the ongoing growth of the BMW brand in a lasting, long-term process.